When we bought the 1/3 acre adjoining our house, the man who owned it (a building contractor) had stored a bunch of his leftover stuff out there. Buckets, hoses, boards with rusting nails, pipes, all covered by a thick carpet of ivy that was climbing high up the tree trunks and choking the smaller trees. The kids couldn't play out there, it was too dangerous, and anyways you couldn't really run around without getting tangled up in the ivy. Every year I dreaded the winter season when the leaves would retreat from trees and bushes, slowly revealing all of the junk on the ground out there (normally from our windows, you see nothing but a view of glorious green), and the view of the junkyard would stay until spring's leaves covered it back up again. Last year, my husband took on the herculean task of removing all of the garbage. Gigantic piles of stuff were hauled away, and he cut the ivy down from the trees. I pulled a lot of it out by hand (until, despite precautions, I got my annual case of Horrifyingly Awful Poison Oak), and this year of course we raked leaves over as much as we could. This spring, a transformation is taking place. Wildflowers are popping up everywhere. 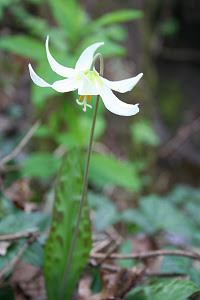 Fawn lillies (Erythronium) are covering the ground, and we even have two trillium! 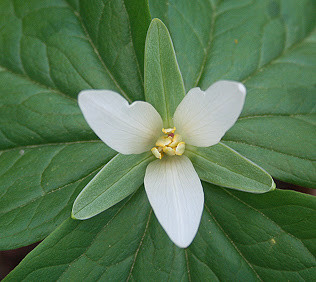 Since trillium seeds can take seven years to germinate, making them hard to get going on your own, this is pretty exciting. Down by the creek, whole phalanxes of camas bulbs are sprouting, and I'm excited to see what turns up next on our little bit of forest that is coming back to life. Twice now we have committed fully to buying a solar system and twice it has not ended up on our roof. This last time, we actually had the panels in our basement, waiting to go up. Both times, we've been stymied by the lack of professionalism in the solar industry. Why is it that when we wanted to look into getting a new heat pump, we call the heat pump specialists in town, they set up an appointment, the guy shows up precisely at the time he says he will, takes a look at our system, gives us a run-down on what we need, and a bid with a solid date we can have the new system in place; yet when you start delving into the world of "alternative" energy, when you commit many thousands of dollars to a solar system, the guys from the solar company don't give you a straightforward bid, can't commit to a date, and never return your phone calls (the first time, six months went by without a phone call). If you ask me, alternative energy will never gain credibility until the people working in the field stop running on rainbow time and start acting like professionals. Now I'm all for stopping to smell the roses and carpe diem and getting all Thich Nhat Han in the moment, but for heaven's sake not when someone is trying to depend on you to be reliable, straightforward, honest, and hardworking. Right now, I'm just very very frustrated, and I still have no solar panels on my roof. We are researching the whole do-it-yourself angle, but then of course you don't get many of the monetary kickbacks from the utility (conveniently, their "approved" people have to put it in and certify it in order to get the monetary credits). We can definitely get a solar hot water gizmo on the roof by ourselves for cheap enough that it doesn't matter, but the solar PV is another story. My next research project will be looking into wind power. I have to smile whenever I hear someone use the word "peeps" these days (as slang for friends) because that's what I've always called our baby chicks. I had this wonderful idea to get out one of our Easter basket, pile all of our peeps into it, and take a cute photo with the kids on the lawn. Unfortunately, the peeps had other ideas and they all popped out of the basket, and ran around the lawn with subsequent pandemonium ensuing as we tried to gather them all back up (the little boogers are fast already!) But we did manage to take this photo while each holding one of them. 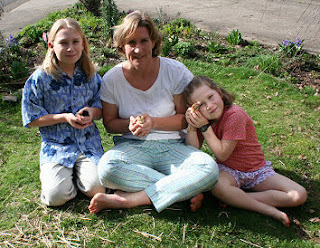 I have no idea how those professional photographers get pictures of babies with bunnies and cute little fluffy chicks. Maybe drug them? I don't know, maybe our chicks are more active than the standard photographic fare, but it was fun anyhow. Thankfully my family watched a movie in the basement the other night. And also thankfully my husband fell asleep downstairs and I wisely decided to not disturb him to come up to bed. I say thankfully because that was the night our hot water heater decided to give up the ghost and start leaking gobs of rusty water all over the place. My light-sleeping hubby managed to get up and turn off the water, mop everything up (albeit with some nice bath towels that are now destined for the dustbin), and avert a total disaster. But now we need a new hot water heater. For years, we've been looking longingly at the tankless or on-demand systems. We first encountered them in Tanzania over a decade ago and wondered why we'd never seen anything so smart in the USA. Over here, we apparently think it's a good idea to keep warming gigantic tanks of water and expend electricity to keep them warm even when no one is using them. Eventually, we saw some gas on-demand heaters come out, but our house isn't hooked up to gas and we don't really want to do so. Now they have electric tankless water heaters that will manage enough water volume for a whole house, so that's what we're researching today. It's not an expenditure we were planning on making right now, but since opportunity has presented itself, it's a good time to get more energy efficient. Many of the new heaters will also work well with a solar hot water system when we eventually get one, so that's a big bonus as well. 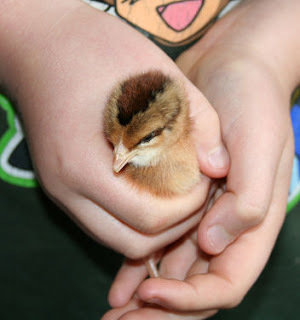 We got our new layer chicks this week, and there's not too many things cuter on this earth than holding a new little baby puffball in your hands. We all got to pick out a couple, so we have Aracaunas, Black Sexlinks, a Blue Andalusian and a Brown Leghorn. Should be an interesting mix of chickens! The peepers are out in the garage for now with a heat light, and I need to get our old chicken tractor back from a friend to use when they get bigger, until they're ready to join the older ladies in the coop. 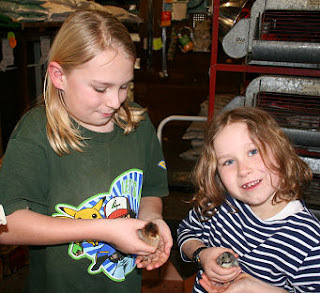 I'm glad that the chicks arrived at our Feed-n-Seed store, because it's been a dark week otherwise. We had to put our beloved 14 year old dog Sabre to sleep this week. Even as old and gimpy as he was at the end, he always got up in the morning and evening to check the chickens with me. He was a shepherd through and through, and his working dog ethic never failed. Even after our other chickens were attacked by the neighbor's dog, they were never afraid of Sabre. He was a gentle and sweet soul, and we will really miss him. I've been having a pretty hard week of it, and posted some on my other blog about all of that. My husband gave me Sabre in the first year after we met, so he's been with us for our entire married life, and the kids have known him through their whole lives too. He went everywhere and did everything with us, so there's a pretty big hole in our lives right now. I know it will get easier with time. In other good news, stay tuned for some possibly exciting news about our solar panels!